I have a new tool! Horizons of Focus, from GTD. I adjusted his horizons to my idiosyncrasies, your mileage may vary as always. Did you know that where the plane parks and refuels is called the apron? I found this out by googling "what is the place before the runway where a plane goes." I am ridiculous, but parking and refueling is a perfect metaphor. I always want to keep in mind that I'm an organism that needs to sleep and eat. I'm also an organism subject to the second law of thermodynamics, order naturally decaying to disorder unless I keep up with chores: making the bed, doing the dishes, sorting the laundry, making the grocery list, cleaning the bathroom, tidying the front room, paying bills. This is also known as the "buttoning and unbuttoning" level; this work is always, constantly, getting done and undone. If I don't keep up, things fall apart and it's a disaster. Sometimes, though, it seems like that's all there is, and I get depressed. So it's best to be efficient here, so you can level up! This level in my scheme is tasks, meaning all the tasks for projects I have to do. 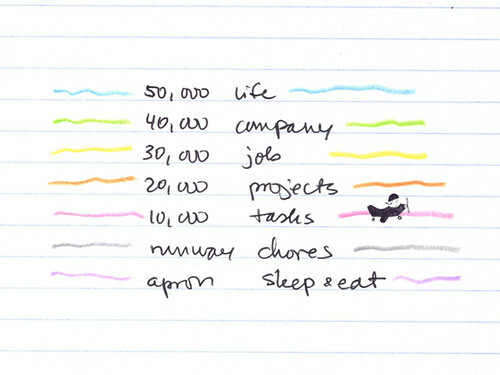 Tasks are different than chores to me. Chores are Sisyphean. With tasks, there's a sense of progress. Now we're getting a little bit up in the sky, this level is where I look at the all the projects I have to do: prioritize them by urgency or importance, and plan what tasks I have to do to get them done. I look at projects once a week when I review and plan. Since I don't have a job, I don't have much to do on this level. When I do, I will look at this once a month. I don't even know if I will end up working for a company. If I do, I will look at this once a quarter. This is where I look at my life. I will look at this once a year, probably this would be a good Winterval exercise. Hey look, I didn't have to break this into seven different posts! Succinct! Now I think of every day as rolling out from the apron onto the runway up to 10,000 feet. How high is that? Is that high enough for an actual plane? I don't hardly get higher than that, I only get to 20,000 feet once a week. But I felt like I was driving my plane back and forth between the apron and the runway for most of April and May, I'm delighted to be off the ground at all. You know that feeling, when you're on a plane, when you can feel that the plane is on the ground and then it's off the ground? That's how I feel.